Last month, KR Design hosted “The Military Spouse Business Summit”, a 4 day virtual event for military spouses who would like to start a business. It was a lot of fun, our speakers were great and the feedback was phenomenal! It was a good thing that the summit was a success because I had a big problem as I was getting ready for the summit. I didn’t know how to reach military spouses about this awesome event. It’s kind of embarrassing to admit. I’m a military spouse myself and I’m supposed to be this great social media marketer and I didn’t know how to reach my audience online! The truth is, I had spent the last 4 years attracting entrepreneurs and business professionals for my business. When KR Design first started in 2010, we were a marketing agency. In 2012, I wanted to change direction. I was getting tired of doing websites, logos, and promotional products and I loved social media. So, we scaled down our services to offer only social media marketing and it was the best decision I ever made for my business. So, for the past 2 years, I’ve spent my time building my business as a social media marketer. This change in my business to military spouses started in November 2013. I was approached by a military spouse who wanted to start her own business. We had known each other for a while and she knew my reputation as a military spouse and social media marketer. She had seen the success I had in my business online with social media and success offline with various speaking engagements in the community. I decided to mentor her since I was a fellow military spouse and was flattered that she came to me for help. Fast forward 6 months later, and she was doing amazing things in her business. This caused me to look for other military spouses to mentor and help them start their businesses. In 2014, it was evident that I was going to change directions in my business again. I was in love with helping military spouses start online businesses that allowed them to work from home doing what they loved! That year, I mentored several military spouses on how to become entrepreneurs and how to avoid the pitfalls I had made in my business. I felt like I was on the brink of something exciting and great! Hence, why I decided to move forward and host “The Military Spouse Business Summit”, to see if there was any interest from military spouses who wanted to start a business. I saw lots of online marketers and colleagues of mine having success with Facebook Ads. I was a little hesitant at first because my previous experiences with Facebook Ads had not been good. But, I had nothing to lose. I started looking at other Facebook Ads in my NewsFeed and applied some of the tips and techniques I had learned from previous courses. Over the next 23 days, I added over 200 military spouses to my email list! Awesome right? I was so proud to see 8-12 people being added to my email list EVERY DAY thanks to the help of Facebook Ads. This instant surge of potential clients made a HUGE difference in my business! So, how did I do it? Well, that’s a special gift that I want to give to you! 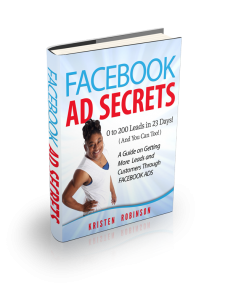 Check out my free guide: “Facebook Ad Secrets: 0 to 200 Leads in 23 Days! (And You Can Too!). It’s my step by step formula for EXACTLY what I did to attract those 200 leads using Facebook Ads. Click here to get your free copy of this guide! I look forward to seeing your success and getting more clients in your business using Facebook Ads! Comment below and let me know what’s been holding you back from using Facebook Ads.